Since we play the majority of our softball games on the Southside of Vancouver, it is pretty convenient to make the hop into Richmond for eats afterwards. However, it seems as if this season is looking more like a weekly pub-crawl, keeping us away from Asian eats. 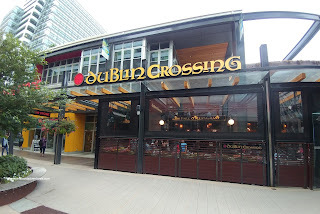 I'd been lobbyingto give Dublin Crossing at Marine Gateway a shot due to its proximity to our games. It wasn't until a staff function at the pub to win me over as the food was pretty tasty as well as the cool decor. After our less-than-stellar experience at another Irish pub (the one with the AYCE wing special), we wanted to see what Dublin Crossing could do better. 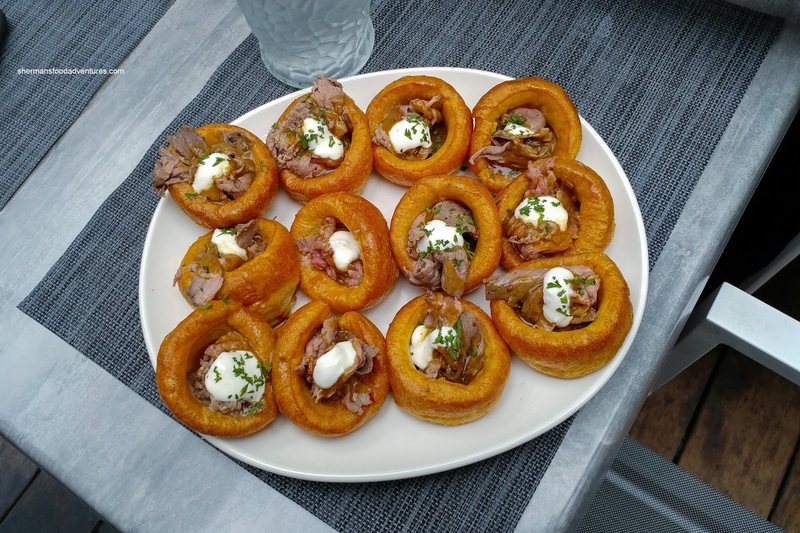 As mentioned, I was able to sample some appies as part of a staff function. 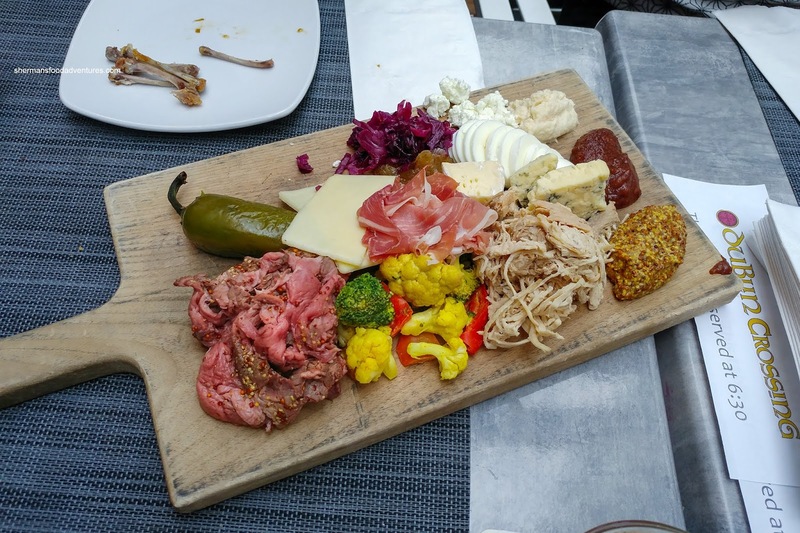 We had the impressively large Ploughman's Board consisting of turkey, roast beef, prosciutto, goat cheese, Stilton blue cheese, aged cheddar and double cream brie. The house-made roast beef was beautifully medium-rare (closer to rare) which meant it was moist and tender. On the other hand, the turkey was on the drier side. This also came with the accompaniments you see on the board as well as bread. Crunchy and fried perfectly, the Crispy Cauliflower was delicious. They were cooked all-the-way-through but still retained the classic firm robust texture. 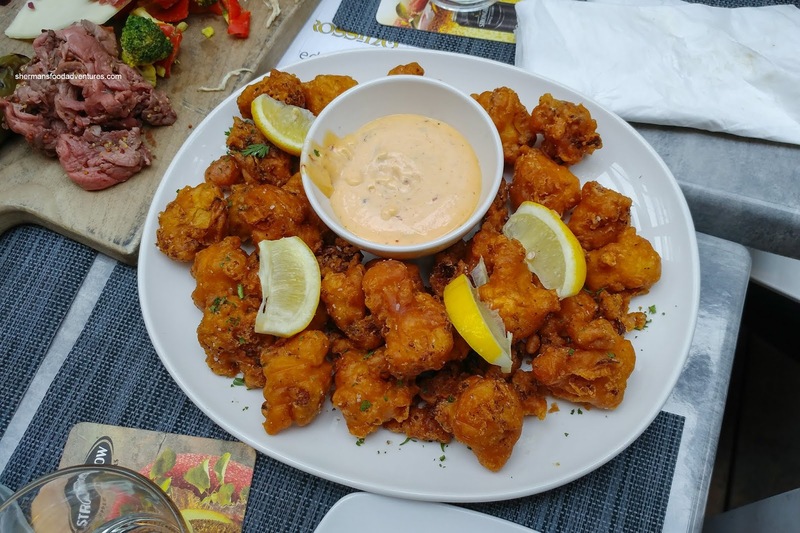 Although they were well-seasoned on their own, the side of raita chili lime mayo was the proverbial icing on the cake as it added a cooling tangy spice. Another solid item was the Stuffed Yorkshire Pudding with house-made roast beef, horseradish sour cream and beef gravy. Normally, you only get 2 in an order (served with mashed potatoes and veggies), but we shared a platter of these as you can see in the picture. Large with a purposeful concave design, the fluffy Yorkshire pudding was also lightly crispy on the outside. The roast beef was tender while the gravy kept things moist. Loved the subtle horseradish flavour in the sour cream. 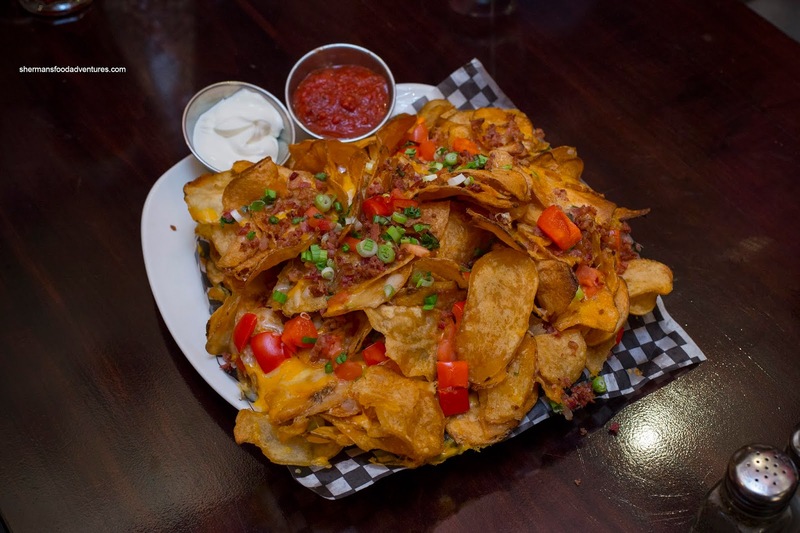 Revisiting the place with my team, we had the Irish Nachos featuring thin cut fried chips topped with layered cheese, bacon, tomato, green onion and red pepper. I had this the first time as well and they delivered once again. This was a huge portion that we barely finished. The chips were crunchy and not overly greasy while the amount of toppings was generous and evenly distributed. Almost resembling a tomato sauce rather than what was described as salsa, it went rather well with the chips. 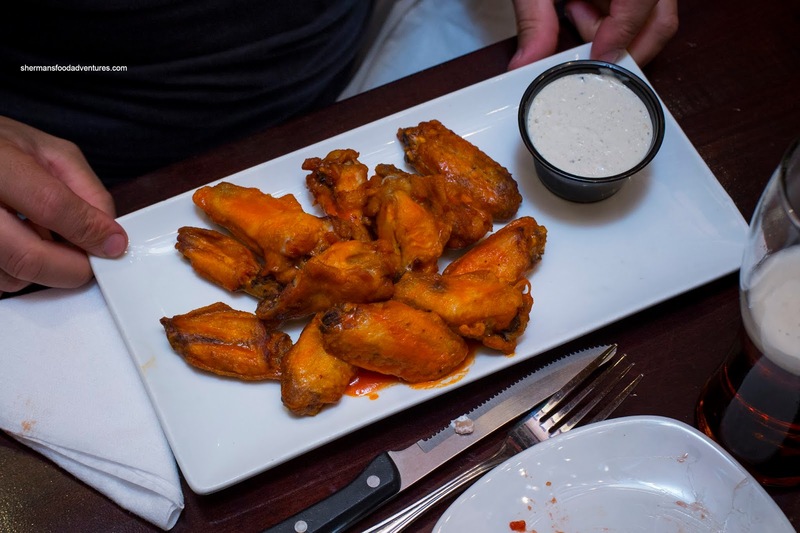 Sens Fan was traumatized by the AYCE wing fiasco at Ceili's, so he wanted to get an order of their Hot Wings to wash away the nightmare. He was a happy man as the wings were fried until crispy with rendered skin. As much as the meat was not juicy per se, it was hardly dry either. There was enough hot sauce to coat each wing without drowning them. There was plenty of flavour to go around where the wing was seasoned properly. 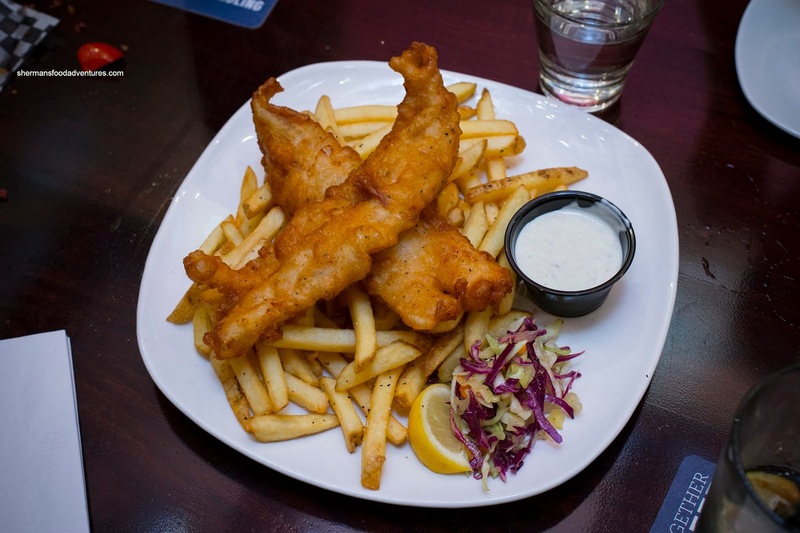 R2D2, Milhouse, Boss Woman and I decided to share some dishes including the Fish & Chips sporting 2 large pieces of cod. They were beautifully fried where the batter was thin and crunchy. The cod itself remained moist and flaky. Once again, there was enough inherent seasoning to eat the fish plain, but the creamy tartar sauce was nicely balanced albeit a bit thin. A touch generic, the fries were prepared well though being hot and crispy. Moving onto some Irish offerings, we also shared the Bangers & Mash with traditional style sausages, caramelized onions, braised cabbage, beef gravy, garlic mashed potatoes and veggies. I found the bangers to be very meaty and lean. They weren't dry though as the meat was still moist. Most of the flavour came from the rich beef gravy, but it was on the saltier side. As much as mashed potatoes are usually an afterthought, this version was really good being creamy, light and flavourful. Veggies were not overcooked and still vibrant. 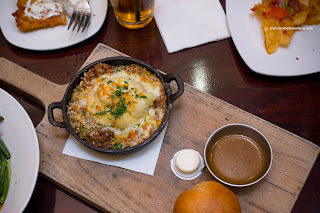 Staying with the yummy mashed potatoes, we had the Cottage Pie made with shredded beef, mixed veggies, panko crumbs and aged cheddar. This was hearty and filling despite not looking like much. 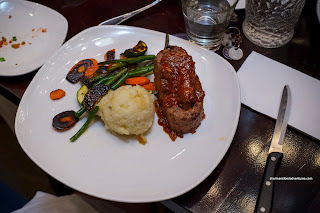 The beef was tender while the mashed potatoes were a bit firmer since they were baked. Despite being rich and flavourful, the gravy was again pretty salty. 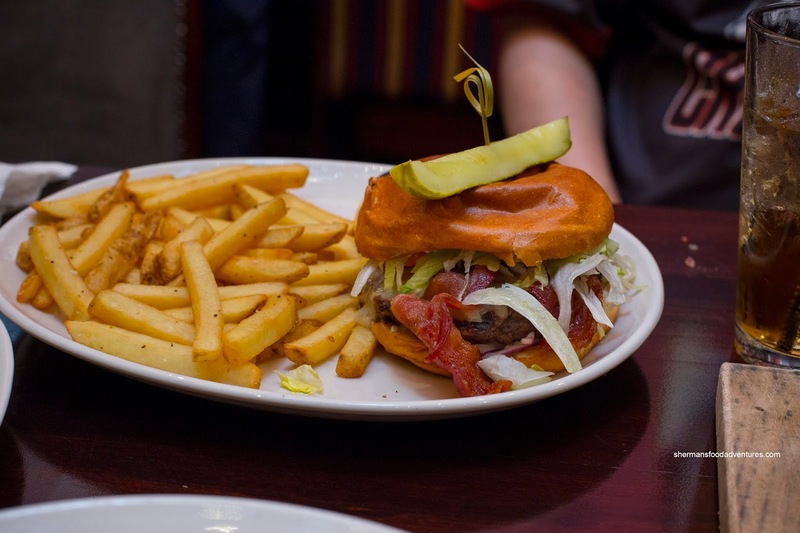 Just to say that we sampled the more popular items, we also got the Belfast Bacon Burger with a 6 oz patty, aged cheddar, smoked bacon, tomato, red onion, lettuce & roasted garlic aioli on a toasted brioche bun. Again, the fries were average, but prepared properly. On the other hand, the burger was pretty good. The patty was moist and natural tasting. There was an appealing smokiness from the 2 large strips of bacon. Judes went off the board (as in the regular menu) and had the Meatloaf with garlic mashed potatoes and veggies. Now if the carrots and zucchini looked a bit burnt, well the reason for this might've been the fact that they forgot her order and probably rushed it. Despite that, the mash was as good as before while the meatloaf was also well-executed. It didn't look very moist but in fact it was. The meat was tender and well-seasoned while not greasy. There could've been more of the tangy glaze on top though. 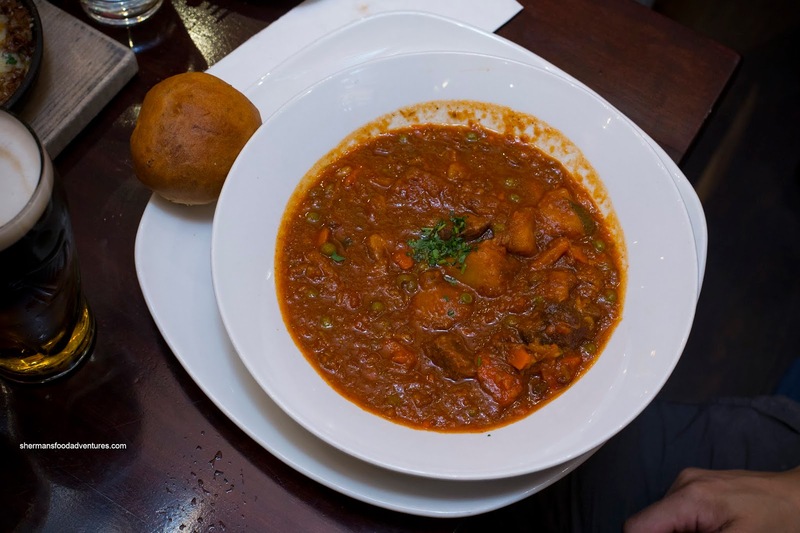 Bear ended up with the St. Patrick's Irish Stew with lamb, potatoes, carrots, leeks and peas in a rich tomato broth. This was a pretty substantial portion that he struggled to finish. It was indeed hearty and full-flavoured, if not a bit salty. The chunks of lamb and potatoes were tender. There was definitely a mild beer essence to go with the meatiness. We found it a bit strange they would use tomatoes, but the stew was ultimately tasty. 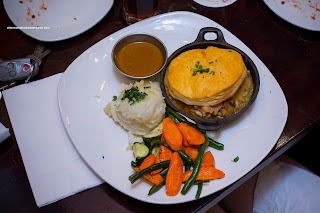 Also on the table was the Chicken Pub Pie sporting chicken, carrots, peas and potatoes in a flaky pastry crust. Served with garlic mashed potatoes, seasonal vegetables and chicken gravy. 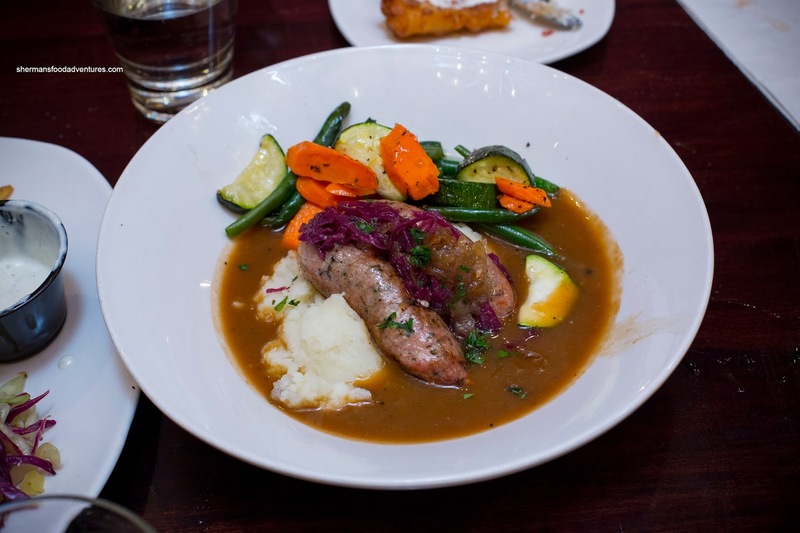 Unlike the other dishes with gravy, this one was not as salty, yet still flavourful. As for the chicken, there was enough of it and generally tender. After trying what was essentially a large chunk of the menu, we were pretty satisfied with the results. Food was more than acceptable, room was nice and best of all, service was quick and friendly.